Taking ahead the vision of Chairman Dr. K.T Mahhe (Chairman –Sreenidhi Educational Group) the KMR Foundation in collaboration with the Sreenidhi Sports Academy is planning to launch a talent Drive program in Sports and identify the talents in Rural Athletes and engage them continuously and train them to develop their skills ,grow and nurture them. For this program to find the interest/talents of students in sports from grade 6, 7 & 8 of high school and 4 & 5 from primary schools, a team of sports staff would visit the village schools to choose the candidates from above grades with the assistance of P.E. Teacher of the schools’ and respective HMs ---from 5th , 6th & 7th March, 2018 after conducting a fitness program recording their height and weight of each student selected and engage them in sports and games to test and find out their ability and interest towards the sport and game for which they would be selected. This talent search program would happen in the afternoon from 3 pm to 4/30 pm in the respective schools in Aziznagar village. The selected students will be engaged in a skill development camp which will be conducted from April 21st to June 4th, 2018 at Sreenidhi campus and Aziznagar high school alternatively for 45 days between 4.45 to 6.15 PM. This camp will help us go for final selection of candidates of their interest /skill. The motive of this program is to nurture and develop the talents in them by continuously engaging them into practice games and conducting tournaments. For this a plan of schedule will be prepared and put into action. The entire program –goals and schedules of plan will be designed after discussion with Chairman Dr. K.T. Mahhe, The foundation & SNSA will be able to ive a picture how these selected students are going to be trained continuously in the respected sports for which they have been selected after June 2018. SPORTS FOR ALL- TALENT SEARCH PROGRAM – FOR AZIZNAGAR VILLAGE STUDENTS. 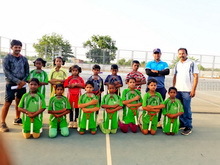 They were divided into groups as per their talent and interest to engage them in training and practice at the Sreendhi campus sports ground for Athletics, Basket ball, Foot ball, Tennis and Squash. 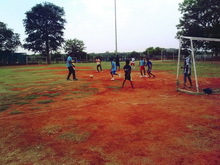 The students are being coached by the respective sports faculty in the above area of their sport. It is indeed heartening to see all the students learn with great enthusiasm and keen interest. They are able to say in English and explain all the important actions related to each game. They are also learning the and the rules and regulations that one has to follow while practicing their chosen game every day. It’s amazing to see their participation with a great zeal and not to waste or lose time. Students come by school transport at 4/45 PM and the session ends by 6 PM. At the end of the activity they are all served with snacks and drinks. In between they get a break for drinking water. Sports For All - a talent search program – 2018 - summer camp for Aziznagar village students: Closing Ceremony on 21st May, 2018. On 21st May, 2018, the students those participated in the Talent Search Program Camp were awarded with a participation certificate at the sports complex of Sreenidhi International School. 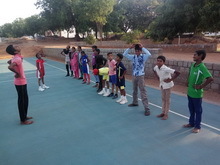 After the inauguration of the Talent search program camp on the 21st, March, 2018 the selected students of 60 from Aziznagar Primary and High School were engaged in training in Athletics, Basketball, Football, Tennis and Squash. 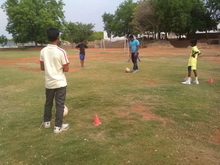 The students were coached by the respective sports faculty. 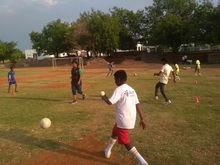 The sports academy after coaching them for a month, from 54 students who attended regularly, based on their talent and skills 31 students were selected comprising 21 boys and 10 girls. Athletics- 4, Squash--4, Basketball -9, Football 11and Tennis 3. The selected students will attend regular coaching session in their selected sport at the Sreenidhi school sports ground along with Sreenidhi students after July, 20, 2018. A schedule of program will be planned and distributed to the students. 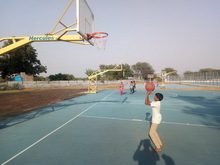 This activity happened at the campus of Sreenidhi International School for a month in the evening between 4/45 to 6 PM . The students were provided with a transport for pick and drop. They were also provided with drinks and snacks after the program.